RainStorm’s team has an enduring affection for their respective fandoms, so it was little surprise that today, May the 4th, brought out some Star Wars love. In celebration, we thought that we’d share one of the few good moments of the infamous Star Wars Holiday Special* in which Princess Leia addresses the Wookies on “Life Day” which are quite appropriate for this day. 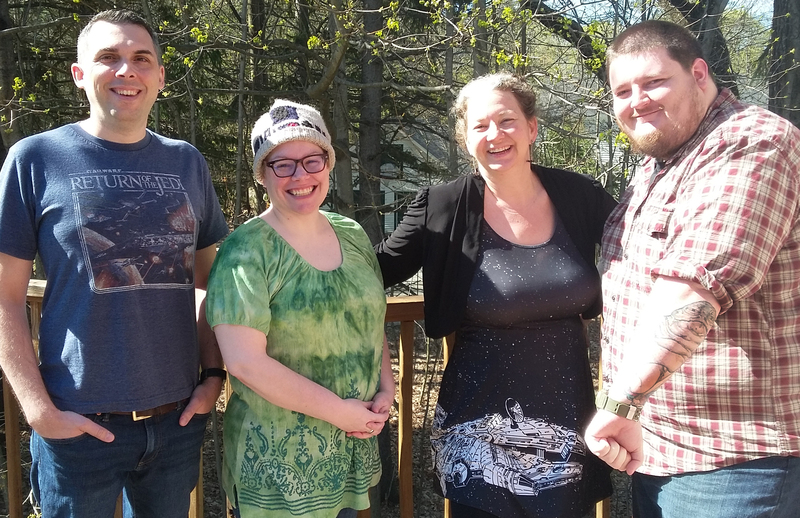 RainStorm’s Orono office celebrates “Star Wars Day” in style! Managing Director Jason Clarke shows off some vintage Return of the Jedi wear, Support Specialist Suze Howe sports an R2D2 hat (but we all know she’d rather it be a Tardis), Client Relationship Manager Monique Bouchard is styling in a starry Millenium Falcon dress, and Web Developer Ian Lusk is literally wearing his appreciation for Star Wars on his sleeve! May the Fourth (and the Force) Be With You!